Video, 7 min. 5 sec. Damir Nikšić’s film If I Wasn’t Muslim (2005) refers to the song If I Was a Rich Man, written in 1964 for the musical Fiddler on the Roof, also known as Anatevka by Sheldon Harnick and Jerry Bock. The musical is based on Sholem Aleichem’s 1894 stories about Tevye the Dairyman; it is one of the most popular musical plays in Poland. The character of Teyve when performed in Polish theaters is usually illustrated by actors wearing crummy fake beards, which trigger unintentional comical effects and contribute to strengthening cultural stereotypes. If I Wasn’t Muslim begins just like the original, with the artist’s short soliloquy to God, although this time it is Allah. Nikšić appropriated and used the commonly recognizable and banal cliché of Jewish adversities in order to talk about the sufferings of Bosnian Muslims. 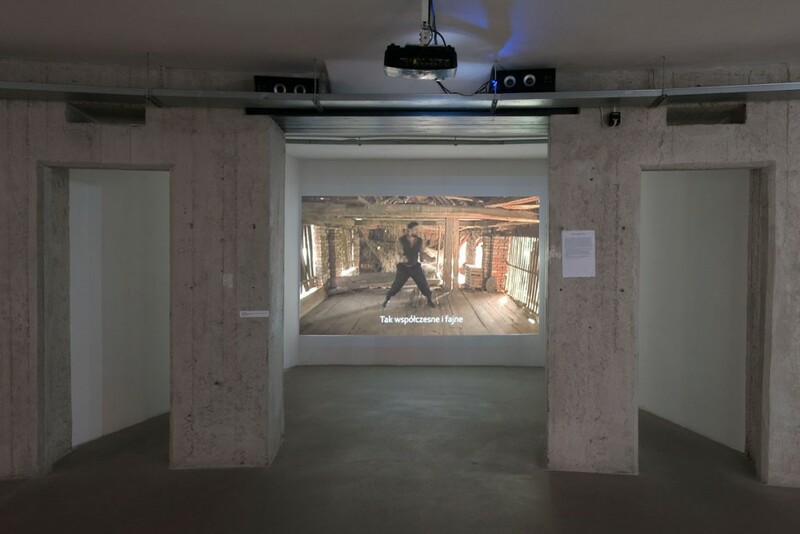 The artist relocated the story of Anatevka to today’s Bosnia, indirectly referring to the Balkan civil war—the bloodiest and most shocking conflict in Europe after 1945. In the narrative of Anatevka, the entire Jewish population of ›troublemakers‹ was about to be evicted by an edict of the Tsar, as we remember from the original, and Nikšić evokes memories of the cruelty and ethnic cleansings of civil war, especially the Srebrenica massacre. An adaptation of Fiddler on the Roof, directed by Norman Jewison with Chaim Topol’s outstanding performance as Tevye, was filmed in the former Yugoslavia, near the villages of Mala Gorica and Lekenik, and in Zagreb, where Nikšić’s aunt and young cousin hid as refugees in the 1990s. Nikšić made his film in Račinovici, a little town in Croatia, across the river from Brezovo Polje, where he was born. Brezovo Polje was created in 1860 for Muslims evicted from Serbian towns and cities—Belgrade, Šabac, Užice, and Socol. In 1992, the Muslims of Brezovo Polje where displaced by the Serbian special forces to the Luka Brčko concentration camp, and later to Batkoviće near Bijeljina, where they were tortured and forced to work as slaves on Serbian farms. Their life was in danger simply because they had Muslim names. Nikšić turns the song into a medium to address the situation of yet another discriminated European minority and transforms it into a weapon against Islamophobia. Damir Nikšić (*1970 in Brčko) studied studied at art academies in Sarajevo, Milano and Bologna and graduated from the Academy of Fine Arts Sarajevo and in Art History and Fine Art at the University of Arizona, Tucson. He lives and works in Sarajevo.